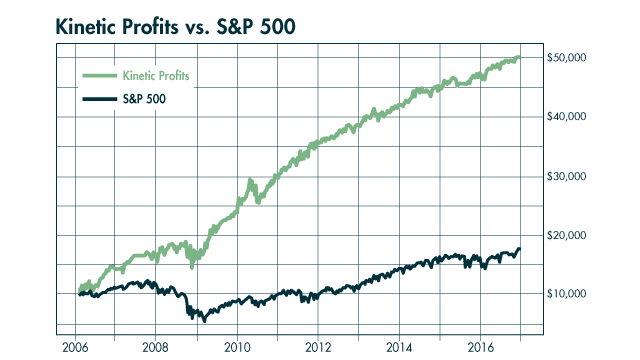 Kinetic Profits uses an arsenal of computing power to give you a statistical edge over Wall Street. As a Kinetic Profits subscriber, you get access to the Kinetic Composite indicator, a proprietary tool that analyzes decades of price data to identify a stock’s strongest periods year after year. Put simply, it shows you when a stock is most likely to be in motion — thus the “Kinetic” part of the name. It finds the best opportunities for investors to potentially enjoy a strong, persistent tail wind in a specific stock. More importantly, this tool is laser-accurate, identifying upward moves in stocks with an unheard-of 93.5% accuracy in real-world testing over more than a decade. Right before a profitable Kinetic Window opens up in a stock, you’ll get an alert sent straight to your inbox. Powering Kinetic Profits is Archimedes, Seven Figure Publishing’s exclusive quantitative research and trading platform. Archimedes is constantly scouring the markets for profitable opportunities that trigger under our system — and it’s able to alert you to them mechanically, with zero emotion or bias. That means, for the first time ever, you can harness a quantitative research team to get a statistical advantage over other market participants. Now’s the time to start trading with a tail wind. 2-3 Monthly Kinetic Profits Trade Recommendations… I comb through Archimedes’ thousands of predictions every week, looking for upcoming kinetic windows and positive K-Scores. Then, I run the trades through the “Ultra-T3M” filter to give us a data-proven 93.5% likelihood of huge profits. Unlimited Access to Kinetic Tools… Hear about a stock you’re interested in buying? Wondering if there’s a good time to trade in and out of big mover? Simply enter the ticker into the Archimedes Prime interface and get a detailed download of Archimedes’ full analysis on the stock. Kinetic Profits’ Digital Download Library… When Archimedes identifies a special situation – such as trading commodities or crypto markets – I’ll issue a special briefing that includes all the intelligence he has uncovered. It will be available for a direct digital download inside the Kinetic Window encrypted website. Weekly Email Check-Ins… I’ll be in touch every week with news my most recent and pressing market analysis and updates on our positions. Kinetic Window “Max Profit Alerts”: I don’t ever expect you to track when any of our kinetic windows close and it’s time to sell. So I send you a direct message as well as post inside the members’ only website when it’s time to take profits and move onto the next kinetic window. White-Glove Member Concierge Service… I’ve arranged for you to have a human touch whenever you need it. Simply contact your VIP concierge team with any questions you may have about your membership at any time. They are highly-skilled and ready to pick up the phone or reply to your email every Monday through Friday during market hours. Seven Figure Publishing hereby agrees to cover the cost for you to take your valued business to any in-house financial research publications… up to a value not exceeding that of your Kinetic Profits membership. These terms shall stand in place of a traditional refund agreement, and remain available so long as the access window to Archimedes Prime is open.